User Environment Management (UEM) is an IT term that most people in the business know for many years already. Starting with the good old Roaming Profiles from Microsoft back in the 90s’ we have moved on. Today we are working with more advanced tooling that will help you bring the optimal user experience to your employees. Desktop and application environments have changed dramatically in the years, in a good way as everything got faster more flexible and more accessible. On the other hand your employees are used to IT more and applications got more demanding. to manage both ways you need to good tool. So that’s almost everything you can think of in a user environment. 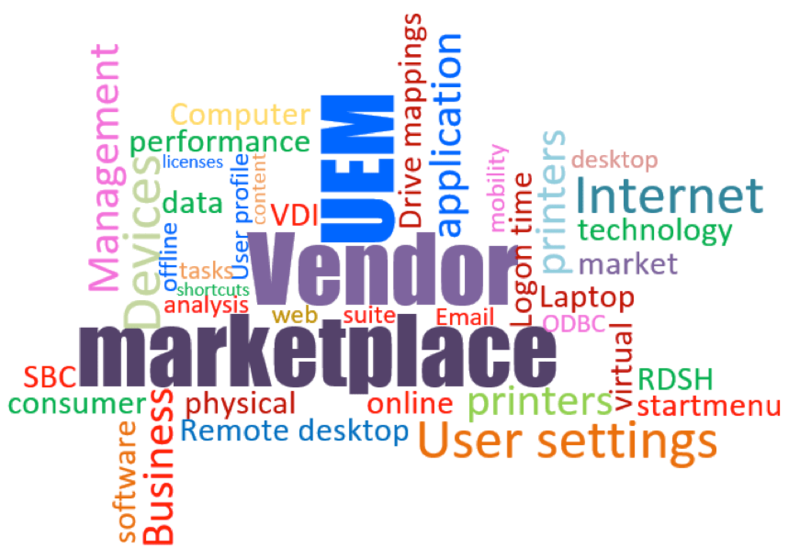 UEM is about applications, drive mappings, printer mappings, resource management, monitoring and so much more. You want to be able to save certain user setting or all of them. you want to push specific settings at certain times, control who starts what under which condition. Control licenses of applications, control how much resources are used or provide for enough resources and so so much more. Read the white paper to see what vendors have to say about their products or suites and learn by reading the whole white paper. Hopefully this gives a good view on what UEM is and what it can deliver to you. 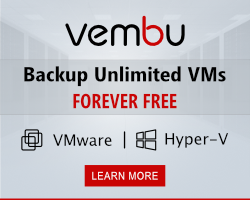 In this version I looked a bit broader, all in the spirit of UEM of course, but I included the suites also as you have the possibility to buy more functionality with that from one vendor. It’s just to be more complete. The latest version now is 16.03, it is the May version of the document and is released today during Citrix Synergy 2016. If you are interested you can download it at this location – click here -. It is the PQR download site, you are asked to enter your E-mail address and name so that we can contact the Dutch people downloading it and invite them for a meeting. If you’re not Dutch you will get an E-mail (Dutch people will also get the E-mail) and there you find the link to download. The E-mail is in Dutch as our marketing is focused on the Netherlands. The E-mail has a link in it where you can download, I’m sure you can find it. I hope you find the document interesting to read. If you find errors, please be kind I’m only human. inform me and I might update the document and publish a 16.04 in June with the corrections. If you are interested in the changes you can read on, if you are not interested and you are just looking for the white paper you’re done. The changes described below are about the name of the document and the inclusion of suites now instead of products. The problem creating a User Environment Management white paper is that there are vendors that offers most of all functionality listed above in one product and most offer that in a bundle of products a suite so to say. Initially the thought was to only write and compare the UEM products but that changed soon to products that work from in the spirit of User Environment Management. That was a good thought but that meant that some would be listed with multiple products and others with only one even though they offer more in suites. For a while we discussed this as it felt unjust, the spiritual thought of the document is not to declare a winner so we should compare apples with apples as far as possible. This week I made a decision, I will add some bullets for vendors that offer a solution in a suite, I will also add some columns for a few vendor products that offer a functionality in a suite. All the added bullets, products are in the spirit of User Environment Management. Saying it otherwise they will help you manage your User Environment in some way. There is one thing I want to say about, I see the mail coming in saying we offer more functionality in our monitoring solution. I know there is more to tell about monitoring, I’m knee, no shoulder deep in monitoring. I added the column and filled in the blanks for the features we had listed for UEM, but didn’t add features as it is a User Environment Management white paper and not a monitoring one. The same goes for application delivery with VMware offering App Volumes and Citrix doing App disk you could end up with a totally different white paper and I don’t want to go that far. So it’s the bullets to show they can offer you that in different product you can buy in a suite but not a rebuild of the matrix. The matrixes that are there have been altered to show the changes, monitoring specifically. So that’s that, more vendors have more bullets blue. I was thinking of changing colours to differentiate between in-product features or solution available features but on a sunny evening I thought who cares. If you look for a solution you want to know if a vendor can help you or if you need multiple vendors to solve the issue. There is one more thing to say about the document, the name has changed. It was named a smackdown by Ruben when he created these. The name was derived for the wrestling games, everyone in IT interested in these documents knew PQR created the smackdowns. Now a few year ahead I got questions from people not familiar with the smackdown what it is, the name is not something native English people would use. In English a comparison white paper with a winner is a bake-off. This white paper doesn’t bring out a winner so a bake-off was the wrong word as well. The white paper compares User Environment Management solutions to each other and therefor it is a comparisons white paper. The document will be renamed to that name from now making it more accessible to new readers and more searchable on Google. Appreciate the pointer to the smackdown white paper, but the pqr.com website appears to have gone missing. Can you provide access to you paper another way? I just checked but the link worked for me. Can you try again?